Snipe is the slightly wavy part on the beginning and ends of boards that you get from a thickness planer - especially from a cheap thickness planer. It's caused because the head mechanism of the planer flexes up and down a little bit, depending on whether the infeed and outfeed rollers are on the board or not. Newer and more expensive planers greatly reduce snipe with locking planer heads, and longer infeed and outfeed tables. My planer is not one of those, unfortunately, and I don't use it quite enough to justify buying a better one. When planing many small pieces, my solution to the snipe problem is to keep the planer fed continuously. Because snipe is caused as the feed rollers roll on or off the ends of the boards, if there is continuous board going through the planer, then this doesn't happen, even if the "continuous board" consists of many short pieces end to end. With shorter pieces, such as the ones shown, this can be a bit hectic, getting a new board in place just in time, and catching the boards that come out of the planer. I pretty much have to be standing beside the planer (as shown) to keep up with it. Still, when I do use this approach, I get no snipe on my boards. Another minor trick with this planer - I put a piece of dowel over the edge of the metal on the top center. This makes the planer much more comfortable to pick up. 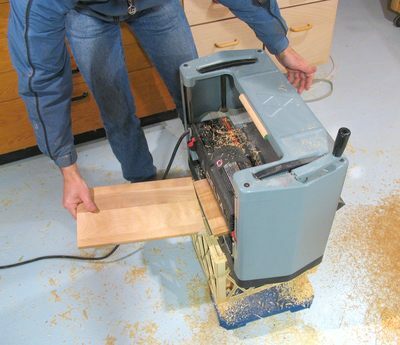 Of course, it comes with handles on either side to pull out, but I always ended up picking up the planer one handed by the center.